AIATSL Customer Agent Job and Other Post – 205 India Air Vacancies. 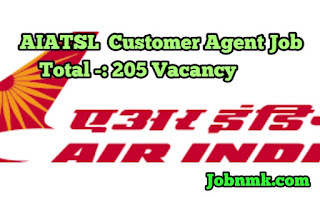 Air India Transport Services Limited Has recently Invited Online Application Form for the post of Customer Agent, Duty Manager and Other Posts in AIATSL, Mumbai, Maharashtra. Those candiate are Interested and want to apply form please read the full notification as given below. Candidates should be have qualification 10th pass, ITI, MBA, Graduate, Diploma from a recognized Institute or University. Relaxation as per rules of government. AIATSL Customer Agent Job and Other Post – 205 India Air Vacancies. Candidates along with his or her all essential documents may appear for the AIATSL Customer Agent Recruitment Walk-in Interview 2019 on 24th April to 7th May 2019 directly. Candiates must carry the application form which is dully filled downloaded from the official porta along with all necessary required documents at the time for interview. System and Training Division 2nd Floor, GSD Complex, Near the Sahar Police Station, Airport Gate No- Five, Sahar, Andheri – E, Mumbai – 400099. We hope you got proper information about AISTSL customer agent job.